Epithelioid hemangioendothelioma (EHE) is a rare vascular (endothelial cell) sarcoma that is composed of mostly round (epithelioid) cells that can arise in soft tissue, bone, and organs such as liver and lung. Benign endothelial cell neoplasms (hemangiomas) are very common while malignant endothelial cell cancers (hemangioendotheliomas and angiosarcomas) are very rare. EHE may arise as a solitary lesion but more commonly presents with metastatic (widespread) involvement, typically involving the liver and lung with numerous small tumor nodules. 61% of liver EHE present with metastatic disease. Disease-specific mortality has been estimated around 13-18% for EHE arising in soft tissue, while the disease-specific mortality rate for EHE in the lung and liver is 40% and 65% respectively.1 Although localized (single lesion) EHE can be resected, there is no reliable medical treatment for metastatic (widespread) EHE, underscoring the need to develop targeted therapy. EHE is a difficult diagnosis histologically and can be confused with carcinoma and other epithelioid vascular neoplasms. Since as a group, the prognosis of epithelioid vascular tumors vary greatly, from benign lesions such as epithelioid hemangioma without any metastatic potential, to very aggressive cancers such as epithelioid angiosarcoma, it is important to classify these lesions precisely. Approximately 90% of EHE are characterized by a reciprocal t(1;3)(p36;q25) translocation. A translocation is a fusion of two chromosomes that are not usually fused. In the case of EHE, the t(1;3) results in fusion of a gene known as WWTR1 (or TAZ) to CAMTA1.2,3 Approximately 10% of EHE have a more recently described gene fusion involving a gene known as YAP with another gene known as TFE3.4 WWTR1 and YAP are related (orthologues) so the fusions presumably do the same thing. Because EHE have either a WWTR1-CAMTA1 (90%) or YAP-TFE3 (10%) gene fusion as the only consistent genetic findings, we propose that all cases of EHE are "addicted" (see blue sidebar below) to the proteins produced from these gene fusions. It is the purpose of our research project to understand how WWTR1-CAMTA1 tansforms EHE and why EHE cells are "addicted" to it. We hypothesize that by understanding how WWTR1-CAMTA1 drives EHE cell transformation, that we can devise therapeutic strategies to treat them. Because most pathologists do not see cases of EHE very often, we are also interested in developing diagnostic tools that make it easy to diagnose EHE. Oncogene addiction is a term coined to describe a condition where a cancer is dependent on a single mutated form of a protein. The mutation can be simple as in BRAF V600E, to which melanoma is addicted. The mutant form of BRAF differs only in one amino acid that turns BRAF into a form of the protein that is always active (constitutively active). Other mutations are more complex like WWTR1-CAMTA1 in EHE where a part of WWTR1 is joined (fused) to a completely different protein, CAMTA1, creating a unique oncogenic (cancer causing) protein. The beauty of oncogene addicted cancers is that their addiction is an Achilles’ heel. Since they are addicted to a single protein, they can be treated by attacking that single protein. Examples of oncogene addicted cancers that have therapies that exploit their addiction are chronic myelogenous leukemia which is addicted to BCR-ABL and gastrointestinal stromal tumor which is addicted to oncogenically mutated/activated KIT. Both of these cancers are treated with imatinib mesylate (Gleevec; Novartis) which is an orally taken compound that inhibits both BCR-ABL and KIT. We proposed two aims in our funded grant submission to the Liddy Shriver sarcoma initiative entitled: "Mechanism of Transformation by the WWTR1/CAMTA1 Fusion Protein in Epithelioid Hangioendothelioma." 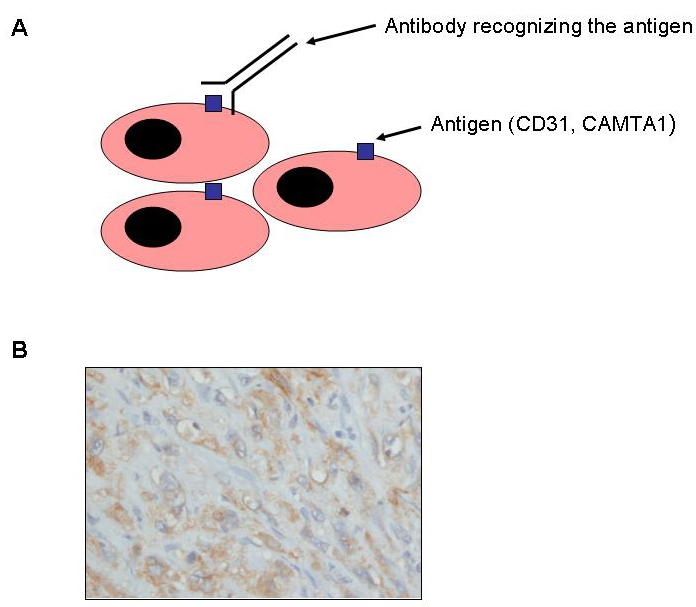 The first aim was to implement an immunohistochemistry-based diagnostic assay for the diagnosis of EHE, based on aberrant expression of CAMTA1. The second aim was to determine the molecular mechanisms that cause the WWTR1-CAMTA1 fusion protein to transform EHE precursor cells. 1. Development of an immunohistochemistry (IHC)-based bioassay for the diagnosis of EHE. Based on our preliminary studies, we hypothesized that CAMTA1 protein expression would be a sensitive and specific bioassay for the diagnosis of EHE. That’s because it is expressed only in neural tissues such as brain, which really do not present a diagnostic problem to differentiate them from EHE. Thus it is really unusual for a tissue or neoplasm to express CAMTA1. If we can detect CAMTA1 expression by ICH then that would be a nice tool for the diagnosis of EHE. It is useful to develop an IHC-based bioassay for the diagnosis of EHE since many pathology laboratories do not have direct access to molecular diagnostics, while they do have access to IHC. As mentioned in our paper in Science Translational Medicine (ref), we previously developed a diagnostic molecular assay that looks for the WWTR1-CAMTA1 gene rearrangement or a surrogate such as WWTR1 gene region rearrangement as tools for the diagnosis of EHE. An IHC-based assay for CAMTA1 expression would allow pathologists to confirm the diagnosis of EHE without the necessity of performing these molecular-based studies. In order to determine the molecular mechanism that causes the WWTR1-CAMTA1 fusion protein to transform EHE precursor cells, we need to develop cell based models of EHE. Quite simply, EHE cell lines (immortalized EHE cancer cells from actual patients) do not exist and cell lines are extremely difficult to develop, especially in very rare cancers where you might only have one or two chances each year to obtain a fresh tumor for culture. Hence, we needed to manufacture an artificial EHE cancer model in our laboratory. We did this by taking a variety of endothelial and other "normal" tissue cell lines and used virally-mediated gene transfer (a method to import genes into cells) to express a WWTR1-CAMTA1 gene fusion in these cells. After successful expression of WWTR1-CAMTA1, we examined the cells to determine whether the behavior of the cells had been altered, indicating that they were at least partially transformed by WWTR1-CAMTA1. To monitor cell behavior, we analyzed our EHE cell models for alterations of the Hallmarks of Cancer (Figure 2), as originally proposed by Hanahan and Weinberg in 2000 and more recently updated in 2011.5,6 The Hallmarks of Cancer¸a landmark cancer publication, organizes various cancer cell activities into thematic groups to understand cancer behavior. The groups are: evading growth suppressors, activating invasion and metastasis, enabling replicative immortality, inducing angiogenesis and resisting cell death. These activities are all hallmark characteristics of cancer cells. To investigate whether our EHE cell line models acquired any of these hallmarks, we performed assays that were surrogates for these hallmarks. What are WWTR1 and CAMTA1? Both WWTR1 and CAMTA1 function as transcription factors. WWTR1 (WW domain-containing transcription regulator 1) (also known as TAZ) is an end effector of the Hippo pathway, an evolutionarily conserved signal transduction pathway important in regulating organ size and is required for anoikis (a type of programmed cell death.7 The Hippo pathway essentially controls WWTR1 activity as one of its main functions. It does this by phosphorlyating WWTR1. WWTR1 is considered a potential oncogene since it is overexpressed in thyroid, lung, and breast carcinomas, and in glial tumors including glioblastoma multiforme, a uniformly fatal brain cancer.8-14 Moreover, WWTR1 is amplified in aggressive breast cancers.11 CAMTA1 (calmodulin-binding transcription activator) is an evolutionarily conserved member of a calmodulin-binding transcription factor family.15,16 In Arabadopsis (a plant), it contributes to drought tolerance.17 In mammals, CAMTA1 plays important roles in cardiac18 and neural development and is thought to function as a tumor suppressor in neuroblastoma,19,20 glial tumors21 and glioblastoma multiforme.22 Thus the fusion protein consists of two transcription factors, one that potentially functions as an oncogene and one that may function as a tumor suppressor. Figure 3: WC promotes colony growth in NIH-3T3 cells in soft agar. Expression of WC fusion protein transforms NIH-3T3 cells. To facilitate our study of mechanisms of WWTR1-CAMTA1-mediated transformation, we developed a cell-based WWTR1-CAMTA1 assay system based on a WWTR1-CAMTA1 cDNA cloned into an expression vector. We assayed over 10 different cell lines including endothelial cell lines and only NIH-3T3 cells (immortalized mouse fibroblasts) were transformed by WWTR1-CAMTA1 expression. As can be seen in Figure 3, only cells expressing either WWTR1-CAMTA1 or NRAS G12V (a prototypical oncogene/cancer causing gene) grew as colonies in soft agar, indicating that these genes transformed the NIH-3T3 cells. Neither the full length nor truncated forms of WWTR1 or CAMTA1 enabled NIH-3T3 colony formation in soft agar, confirming that elements from both WWTR1 and CAMTA1 are necessary for cellular transformation in NIH-3T3 cells. Because WWTR1/CAMTA1 is most likely to function as a transcription factor, it is unlikely that this protein functions directly to transform EHE precursor cells. It is much more likely that it transforms cells indirectly by activating the expression of a group of genes/proteins that directly transform EHE precursors. To determine the list of genes that are regulated by WWTR1/CAMTA1, we used gene microarray chips, sophisticated instruments that can measure the expression of virtually every gene in the mouse genome (NIH-3T3 cells are mouse fibroblasts) simultaneously. Figure 4: Validation of WC upregulated genes in NIH-3T3 cells. p < 0.280 for CAMTA1 gene signature overlap – determined by hypergeometric analysis. After demonstrating that WC directed a WWTR1-dominant expression signature in NIH-3T3 cells, we wondered if we could detect this WWTR1-dominant gene signature in human EHE in order to validate our in vitro model. There were 18 genes in common with the published WWTR1 gene expression signature overlap at 2 of 3 time points in NIH-3T3 cells. We compared these genes with the relative expression derived from whole transcriptome (RNA-seq) analysis of an EHE tumor (25,922 genes total) showing significant overlap with this subset of genes (Table 2). Thus, our data argue that WWTR1-CAMTA1 directs a WWTR1-dominant transcriptional program or ‘signature’ both in NIH-3T3 cells and in a human EHE cancer specimen. We set out to develop an IHC-based diagnostic assay that would be sensitive and specific for the diagnosis of EHE. Unfortunately, due to a lack of good antibodies that can be used on traditional tissue sections, we were unsuccessful in this endeavor. However, our studies into the mechanism of how WWTR1-CAMTA1 transforms cells revealed that WWTR1-CAMTA1 functions as a transcription factor that directs a WWTR1-dominant transcription program. 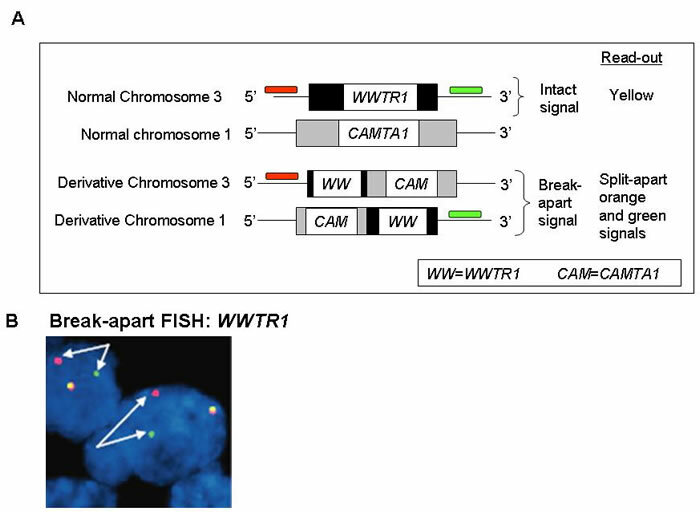 Further studies are underway to understand exactly how fusion of CAMTA1 to WWTR1 activates WWTR1 transcription and how this transcriptioanal program leads to cellular transformation and cancer. 1. Weiss, S.W., Goldblum, J.R., Epithelioid Hemangioendothelioma, in Enzinger and Weiss's Soft Tissue Tumors. 2008, Mosby: Philadelphia. p. 681-687. 2. Errani, C., et al., A novel WWTR1-CAMTA1 gene fusion is a consistent abnormality in epithelioid hemangioendothelioma of different anatomic sites. Genes Chromosomes Cancer, 2011. 50(8): p. 644-53. 3. Tanas, M.R., et al., Identification of a disease-defining gene fusion in epithelioid hemangioendothelioma. Sci Transl Med, 2011. 3(98): p. 98ra82. 4. Antonescu, C.R., et al., Novel YAP1-TFE3 fusion defines a distinct subset of epithelioid hemangioendothelioma. Genes Chromosomes Cancer, 2013. 52(8): p. 775-84. 5. Hanahan, D. and R.A. Weinberg, The hallmarks of cancer. Cell, 2000. 100(1): p. 57-70. 6. Hanahan, D. and R.A. Weinberg, Hallmarks of cancer: the next generation. Cell, 2011. 144(5): p. 646-74. 7. Hong, W. and K.L. Guan, The YAP and TAZ transcription co-activators: key downstream effectors of the mammalian Hippo pathway. Semin Cell Dev Biol, 2012. 23(7): p. 785-93. 8. Bhat, K.P., et al., The transcriptional coactivator TAZ regulates mesenchymal differentiation in malignant glioma. Genes Dev, 2011. 25(24): p. 2594-609. 9. Cordenonsi, M., et al., The Hippo transducer TAZ confers cancer stem cell-related traits on breast cancer cells. Cell, 2011. 147(4): p. 759-72. 10. Lai, D., et al., Taxol resistance in breast cancer cells is mediated by the hippo pathway component TAZ and its downstream transcriptional targets Cyr61 and CTGF. Cancer Res, 2011. 71(7): p. 2728-38. 11. Matteucci, E., et al., Bone metastatic process of breast cancer involves methylation state affecting E-cadherin expression through TAZ and WWOX nuclear effectors. Eur J Cancer, 2013. 49(1): p. 231-44. 12. Skinner, M., Cancer stem cells: TAZ takes centre stage. Nat Rev Cancer, 2012. 12(2): p. 82-3. 13. Xie, M., et al., Prognostic significance of TAZ expression in resected non-small cell lung cancer. J Thorac Oncol, 2012. 7(5): p. 799-807. 14. Zhao, D., et al., TAZ antagonizes the WWP1-mediated KLF5 degradation and promotes breast cell proliferation and tumorigenesis. Carcinogenesis, 2012. 33(1): p. 59-67. 15. Doherty, C.J., et al., Roles for Arabidopsis CAMTA transcription factors in cold-regulated gene expression and freezing tolerance. Plant Cell, 2009. 21(3): p. 972-84. 16. Finkler, A., R. Ashery-Padan, and H. Fromm, CAMTAs: calmodulin-binding transcription activators from plants to human. FEBS Lett, 2007. 581(21): p. 3893-8. 17. Galon, Y., et al., Calmodulin-binding transcription activator 1 mediates auxin signaling and responds to stresses in Arabidopsis. Planta, 2010. 232(1): p. 165-78. 18. Muller-Borer, B., et al., Calcium dependent CAMTA1 in adult stem cell commitment to a myocardial lineage. PLoS One, 2012. 7(6): p. e38454. 19. Henrich, K.O., et al., Allelic variants of CAMTA1 and FLJ10737 within a commonly deleted region at 1p36 in neuroblastoma. Eur J Cancer, 2007. 43(3): p. 607-16. 20. Henrich, K.O., et al., Reduced expression of CAMTA1 correlates with adverse outcome in neuroblastoma patients. Clin Cancer Res, 2006. 12(1): p. 131-8. 21. Barbashina, V., et al., Allelic losses at 1p36 and 19q13 in gliomas: correlation with histologic classification, definition of a 150-kb minimal deleted region on 1p36, and evaluation of CAMTA1 as a candidate tumor suppressor gene. Clin Cancer Res, 2005. 11(3): p. 1119-28. 22. Schraivogel, D., et al., CAMTA1 is a novel tumour suppressor regulated by miR-9/9* in glioblastoma stem cells. EMBO J, 2011. 30(20): p. 4309-22. 23. Henrich, K.O., et al., CAMTA1, a 1p36 tumor suppressor candidate, inhibits growth and activates differentiation programs in neuroblastoma cells. Cancer Res, 2011. 71(8): p. 3142-51. 24. Zhang, H., et al., TEAD transcription factors mediate the function of TAZ in cell growth and epithelial-mesenchymal transition. J Biol Chem, 2009. 284(20): p. 13355-62. 25. Rice, J.A., Mathematical Statistics and Data Analysis. 3rd ed. 2007, Belmont, CA: Duxbury Press. 42. Epithelioid hemangioendothelioma (EHE) is a rare vascular (endothelial cell) sarcoma that can arise in soft tissue, bone, and parenchymal organs such as liver and lung. Endothelial cells are the cells that line blood vessels. Benign endothelial cell neoplasms (hemangiomas) are very common while malignant endothelial cell tumors are very rare. EHE is characterized by a reciprocal t(1;3)(p36;q25) translocation.1 EHE may arise as a solitary lesion but also has a tendency to present with multifocal/metastatic involvement, especially when it arises in the liver and lung. 61% of liver EHE develop metastasis (spread to other tissues/organs). Disease-specific mortality has been estimated around 13-18% for EHE arising in soft tissue, while the disease-specific mortality rate for EHE in the lung and liver is 40% and 65% respectively.2 Although localized EHE can be resected, there is no medical treatment for multifocal/metastatic EHE, underscoring the need to develop targeted therapy. EHE is a difficult diagnosis histologically and can be confused with carcinoma and other epithelioid vascular neoplasms. Since as a group, the prognosis of epithelioid vascular tumors vary greatly, from benign lesions such as epithelioid hemangioma without any metastatic potential to very aggressive cancers such as epithelioid angiosarcoma, it is important to classify these lesions precisely. Because EHE is difficult to classify correctly, there is a need for a specific and sensitive biomarker to objectively confirm the diagnosis of EHE. What is a chromosomal translocation? Chromosomes, are composed of two arms, a short or "p" arm and a long or "q" arm. A translocation occurs when two chromosomes swap arms due to an error in DNA replication or repair (Figure 1). When two chromosomes swap arms there is always the potential for fusion of two genes at the site of chromosome fusion since the chromosome breaks can occur directly in the middle of genes. Disease-defining translocations, such as the t(1;3) translocation which fuses the short arm of chromosome 1 to the long arm of chromosome 3 in EHE, are common in sarcomas. Generally, the fusion genes created at these chromosomal fusion sites are the initiating tumorigenic events that cause these cancers. That is why it is so important to study them. They are the "big bang" that causes the cancers, so understanding what they do to cause cancer is central to coming up with cures. What is next generation, deep transcriptomic sequencing? Next generation sequencing refers to recently developed technologies that can determine the sequence of a tremendous amount of DNA or RNA. It took several years to originally figure out the DNA sequence of a single individual. With next generation sequencing, this can be done in days. Transcriptomic sequencing means that RNA is sequenced instead of DNA. This is an advantage because RNA encodes only the expressed, functional part of genomic DNA, which comprises only 1-2% of the total genome. Sequencing of RNA provides information only about DNA that has been transcribed into RNA; thus representing a focused sequencing approach. Deep sequencing implies that each piece of RNA is sequenced many times (approximately 50 times) so that nothing is missed. We validated the presence of the WWTR1/CAMTA1 fusion transcript in several additional EHE cases. The fusion transcripts resulted in fusion of either exon 2 or 3 of WWTR1 to a breakpoint within exon 9 ofCAMTA1, giving rise to type 1 or 2 fusion transcripts, respectively. WWTR1 was fused "in-frame" to CAMTA1in all five tumors, suggesting that a functional protein was being produced. Using RNA in-situ hybridization, we confirmed expression of the WWTR1/CAMTA1 transcript within EHE tumor cells, but not in epithelioid hemangioma. RNA in-situ hybridization also demonstrated that epithelioid hemangioma did not contain expression of CAMTA1, which is an important point below for our proposal to use immunohistochemistry (IHC) for CAMTA1 as a diagnostic aid for EHE. Break-apart DNA FISH assays were developed for use in formalin-fixed paraffin embedded (FFPE) tissue using fluorescent-labeled bacterial artificial chromosome (BAC) probes to determine the incidence and specificity of the WWTR1/CAMTA1 gene fusion in 165 vascular tumors including 42 additional EHE cases. We found that WWTR1 and CAMTA1 gene rearrangements were present in 87% and 89% of EHE respectively, indicating that the WWTR1/CAMTA1 gene fusion is sensitive for the diagnosis of EHE. WWTR1and CAMTA1 gene rearrangements were absent from all other vascular neoplasms (26 different vascular tumor entities/118 total cases), demonstrating the WWTR1/CAMTA1 fusion gene to be a highly specific, disease-defining genetic alteration in EHE. What is a "break apart" FISH assay? Break apart FISH assays are commonly used in molecular diagnostics to show that a particular gene region is rearranged, indicating that the region is involved in a chromosomal translocation. DNA is a duplex composed of two complementary strands and each strand contains infinite combinations of only four bases, known as adenine (A), cytosine (C), guanine (G) and thymine (T). There are rules about how the bases can pair in opposite strands. A binds to T and C binds to G. So if the sequence of one strand is ATTT, then the opposite strand has to be AAAT due to complementary base pairing. You can imagine that a gene that is thousands of bases long has a very specific sequence. It is this sequence specificity that allows us to make DNA "probes" that bind to only one region of the DNA. In the case of a break apart FISH assay, the probes are several hundred thousand to around a million bases in length in general, generating tremendous specificity and signal. To visualize the probes, they are labeled with fluorescently labeled nucleotides which cause them to glow when visualized under a fluorescent microscope. Probes on both sides of the gene of interest are generated. The probe before the gene (the 5’ probe) is labeled with DNA nucleotides that will fluoresce one color and the probe after the gene (the 3’ probe) is labeled with DNA nucleotides that will fluoresce another color (Figure 2). Typically the probes are labeled DNA nucleotides that will fluoresce red/orange or green. When the gene is not rearranged or broken apart, a single yellow signal (red/orange and green combined) is observed. When the gene is rearranged, a red and a green signal are observed. Each nucleus within the tumor is scored as to whether there is a together or a broken apart signal to determine whether the tumor contains the translocation. WWTR1 and CAMTA1 are both poorly-studied transcription factors. WWTR1 is composed of 7 exons encoding a protein containing a 14-3-3 binding site (exon 2), a WW domain (exons 2-3), a coiled coil domain (exons 4-5), and a PDZ binding motif (exon 7).6 CAMTA1 has 23 exons encoding a protein containing a CG-1 domain (exons 3-7), a TIG domain (exons 9-11), a series of ankyrin repeats (exons 13-15), and calmodulin binding/IQ domains (exons 19-20).7 The protein resulting from the fusion 1 transcript is expected to contain the 14-3-3 binding site and a portion of the WW domain (protein binding domain) from WWTR1 fused to the TIG domain (putative DNA binding domain), ankyrin repeats, and calmodulin binding domains/IQ domains of CAMTA1. The protein resulting from the fusion 2 transcript is essentially the same, but would contain the entire WW domain from WWTR1 (Figure 3). Transcription factors are proteins that are critical to cell function because they regulate transcription, the process by which DNA is transcribed into RNA. RNA encodes proteins so transcription factors indirectly control the spectrum of proteins produced by a cell. The spectrum of proteins produced by each cell controls that cells behavior, theoretically dictating whether a cell is "normal" or a cancer cell. Using a bioinformatics approach to mine the expression array literature, we found evidence that WWTR1 andCAMTA1 are differentially expressed in endothelial cells. While WWTR1 is expressed strongly, CAMTA1 is not expressed in endothelial cells. Indeed, CAMTA1 appears to be expressed exclusively in the central nervous system.8-10 To validate the bioinformatics data, we performed quantitative real-time PCR on primary endothelial cells, which demonstrated that WWTR1 is expressed at 103 to 106 times higher levels thanCAMTA1, depending on which endothelial cells are evaluated (data not shown). Since we performed absolute quantitation, we know that CAMTA1 is expressed at 100 to 100,000 copies per microgram of total RNA, which is towards the lower level of detection of the assay and indicates very poor expression in endothelial cells. 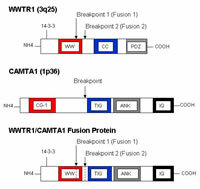 We hypothesize that the WWTR1-CAMTA1 fusion gene is oncogenic due to a ‘promoter switch mechanism’ whereby the most of the CAMTA1 protein is expressed at much higher levels than normal in the precursor cell that gives rise to EHE, since CAMTA1 expression is placed under the control of an active WWTR1promoter (Figure 4). Inherent in this hypothesis is that deregulation of CAMTA1 drives oncogenesis. Because CAMTA1 is thought to act as a transcriptional regulator, it is likely that CAMTA1 drives an oncogenic transcriptional program that transforms EHE precursor cells. To determine the molecular mechanism that causes the WWTR1-CAMTA1 fusion protein to transform EHE precursor cells. Based on our preliminary studies, we believe that CAMTA1 protein expression will be a sensitive and specific bioassay for the diagnosis of EHE. It is useful to develop an IHC-based bioassay for the diagnosis of EHE since many pathology laboratories do not have direct access to molecular diagnostics, while they do have access to IHC. An IHC-based assay for CAMTA1 expression would allow pathologists to confirm the diagnosis of EHE in their own laboratories. To accomplish our first aim, we will screen commercially available CAMTA1 antibodies against EHE in FFPE. If these antibodies fail to detect CAMTA1, we will develop our own monoclonal antibodies for this purpose. The success of this aim relies on the ability to develop antibodies that readily recognize CAMTA1 in FFPE. If commercial antibodies or our own CAMTA1 antibodies can successfully detect CAMTA1 in FFPE, we will screen a comprehensive set of vascular tumors for expression of CAMTA1. Because we identified CAMTA1 gene rearrangements solely in EHE, and because endothelial cells and endothelial cell tumors do not express CAMTA1 or express it at very low levels (as demonstrated above by quantitative RT-PCR on primary endothelial cells and RNA in-situ hybridization), we predict that detection of CAMTA1 protein expression by IHC will be a sensitive and specific biomarker for the diagnosis of EHE. In the event that we are unable to identify or develop diagnostic antibodies, we can still rely on our FISH-based and RT-PCR-based molecular assays that we have already developed and validated. What is immunohistochemistry? Immunohistochemistry describes a technique where antibodies are used to detect the presence/absence of specific proteins in tissue sections. 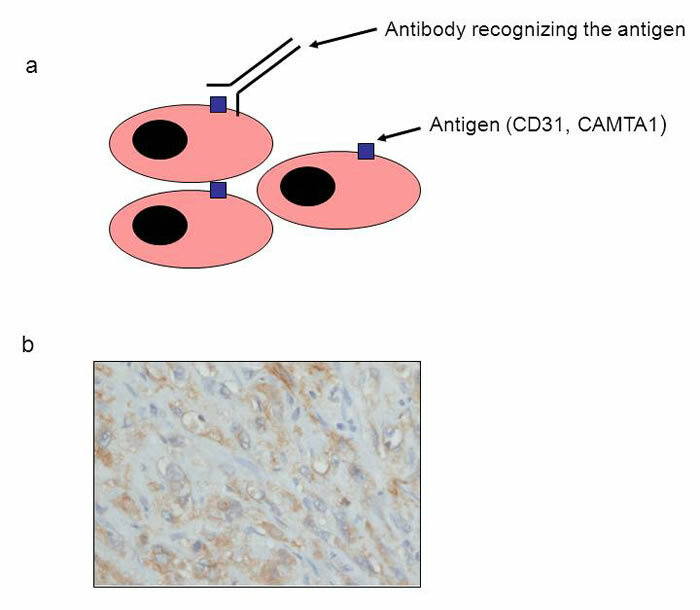 By using antibodies that are generated to CAMTA1, we can detect whether or not CAMTA1 is present or not in tumor cells. CD31 is an endothelial specific, but not EHE specific protein that is present in EHE. The brown staining indicates that CD31 is present within the tumor cells as is shown in Figure 5. In order to determine the molecular mechanism by which the WWTR1/CAMTA1 fusion protein transforms EHE precursor cells, we will need to develop cell-based models of EHE. EHE cell lines are not currently available; they simply do not exist. Hence, we will need to manufacture them in our laboratory. We will do this by taking a variety of endothelial and other "normal" tissue cell lines and use virally-mediated gene transfer to express the WWTR1-CAMTA1 gene fusion in these cells. After successful expression of WWTR1-CAMTA1, we will need to determine if the behavior of the cells has been altered, indicating that they have at least partially been transformed. To monitor cell behavior, we will analyze our EHE cell models for alterations in the Hallmarks of Cancer (Figure 6), as originally proposed by Hanahan and Weinberg in 201011 and more recently updated in 2011.12 The Hallmarks of Cancer, a landmark cancer publication, organized various activities of cancer cells into thematic groups to understand cancer behavior. The groups are: evading growth suppressors, activating invasion and metastasis, enabling replicative immortality, inducing angiogenesis and resisting cell death (Figure 6). These activities are all hallmark characteristics of cancer cells. 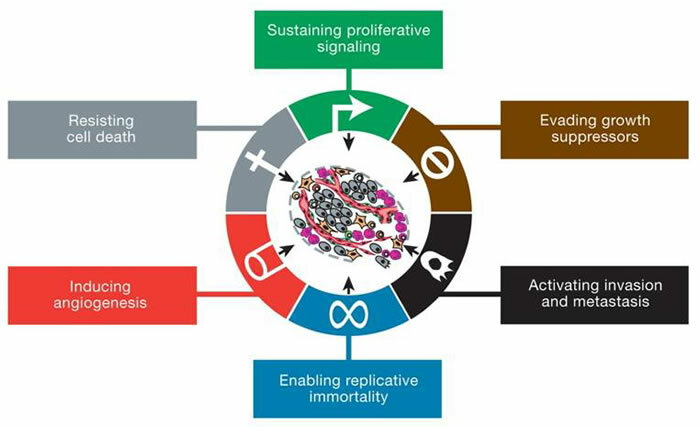 To investigate whether our EHE cell line models have acquired any of these hallmarks, we will perform the following assays: We will examine them for alterations in senescence (enabling replicative immortality), proliferation (sustaining proliferative signaling), resistance to apoptosis (resisting cell death), growth factor independence (sustaining proliferative signaling), anchorage independent growth (evading growth suppressors, sustaining proliferative signaling, activating invasion and metastasis) and cell migration (activating invasion and metastasis). Once we have determined whether any of these properties have been altered, this will give us a sense of what WWTR1/CAMTA1 is doing to transform EHE precursor cells. For instance, if the cells exhibit increased proliferation and inhibition of senescence and proliferation, then we will conclude that the WWTR1/CAMTA1 fusion protein transforms EHE precursors by activating proliferation and inhibiting senescence and cell death. Because WWTR1/CAMTA1 is most likely a transcriptional activator, it is unlikely that this protein functions directly to transform EHE precursor cells. It is much more likely that this protein transforms these cells by activating the expression of ("turning on") a group of genes/proteins that directly transform EHE precursor cells. To determine the list of genes that are regulated by WWTR1/CAMTA1, we will use gene expression microarray chips, which can simultaneously measure the levels of each gene in the human genome and report on variations in gene levels. Once we have determined the list of genes that are controlled by WWTR1/CAMTA1, we can narrow down the list of candidate cancer causing/transforming genes by integrating that list with lists of genes that fall into behavior categories identified in our hallmarks of cancerexperiments (Fig. 6). This integrative analysis where we use one set of experiments to filter the results of another set of experiments is a powerful method to limit the number of genes/proteins identified for further study, and allows us to focus only on the most important candidate genes/proteins. An IHC-based bioassay for the diagnosis of EHE. A proposed mechanism for how EHE transforms EHE precursor cells including a list of genes that are involved in this process. The development of an easy, sensitive, and specific bioassay for the diagnosis of EHE will facilitate accurate diagnosis of EHE. Correct diagnosis is the first step towards obtaining the correct therapy and disease management. Identification of the mechanism of transformation, including the relevant genes/proteins that play important roles in EHE tumorigenesis is a first step towards identifying pharmacological/medical therapies. This is especially important for a cancer like EHE where multifocal disease and metastasis are common, limiting surgical options. 1. MR Mendlick, M Nelson, D Pickering, et al. Translocation t(1;3)(p36.3;q25) is a nonrandom aberration in epithelioid hemangioendothelioma. Am J Surg Pathol 25, 684-687 (2001). 2. SW Weiss and JR Goldblum. Enzinger and Weiss’s Soft tissue Tumors, 5th Ed. 681-687. (Mosby Elsevier, Philadelphia, 2008). 3. A Sboner, L Habegger, D Plfueger, et al. FusionSeq: a modular framework for finding gene fusions by analyzing paired-end RNA-sequencing data. Genome Biol 11, R104 Epub 2010 Oct 21 (2010). 4. MR Tanas, A Sboner, AM Oliveira, et. al. Identification of disease-defining gene fusion in epithelioid hemangioendothelioma. Sci Trans Med 3(98):98ra82 (2011). 5. C Errani, L Zhang, YS Sung, et. al. A novel WWTR1-CAMTA1 gene fusion is a consistent abnormality in epithelioid hemangioendothelioma of different anatomic sites. Genes Chromosomes Cancer 50:644-653 (2011). 6. K Wang , C Degerny, M Xu, et al. YAP, TAZ, and Yorkie: a conserved family of signal-responsive transcriptional coregulators in animal development and human disease. Biochem Cell Biol 87, 77-91 (2009). 7. A Finkler, R Ashery-Padan, and H Fromm, CAMTAs: Calmodulin-binding transcription activators from plants to human.FEBS Lett 581, 3893-3898 (2007). 9. AI Su, MP Cooke, KA Ching, et al. Large scale analysis of the human and mouse transcriptomes. Proc Natl Acad Sci USA 99, 4465-4470 (2002). 10. AI Su, T Wiltshire, S Batalov, et al. A gene atlas of the mouse and human protein-encoding transcriptomes. Proc Natl Acad Sci USA 101, 6062-6067 (2004). 11. D Hanahan, RA Weinberg. Hallmarks of cancer. Cell 100, 57-70 (2010). 12. D Hanahan, RA Weinberg. Hallmarks of cancer: the next generation. Cell 144, 646-74 (2011). The normal chromosomes are on the left and the derivative chromosomes (containing the translocated segments of DNA) are on the right of each pair of chromosomes. The arrows indicate the translocated segments. Figure 1B: Partial karyotype showing the t(1;3) translocation involving the chromosomes from an actual EHE. Plan Figure 2A: Schematic diagram for break apart FISH probe biosassays. Figure 2B: Break-apart signal for WWTR1 probes in EHE cells (nuclei in blue), indicating the presence of the t(1;3) translocation. The normal chromosome 3 appears yellow because the probes are not apart. 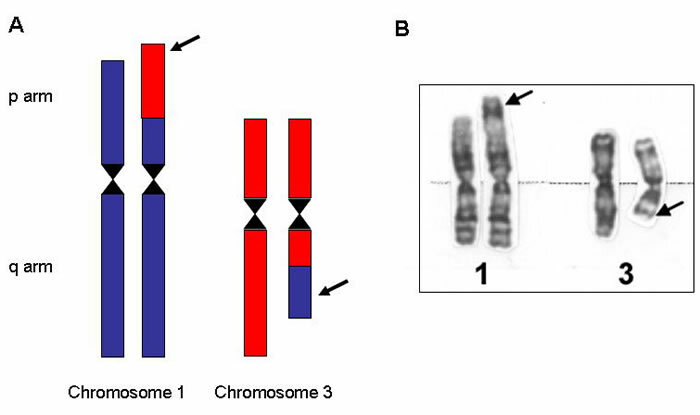 The derivative chromosome shows a split red-green pair (arrows) indicating rearrangement of chromosome 3. 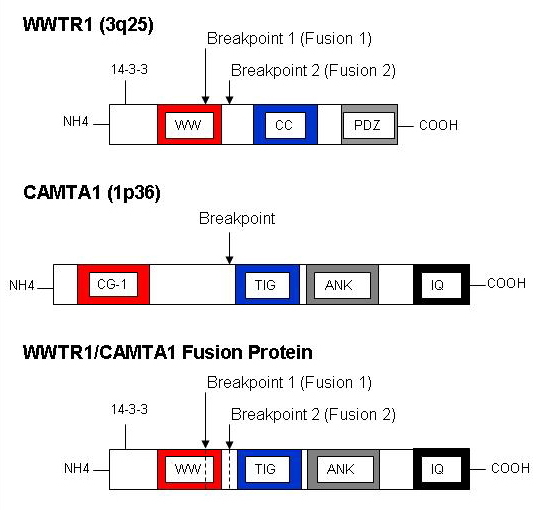 The fusion protein results in the WW domain from WWTR1 being fused in frame to the TIG domain, ankyrin repeat domain, and the calmodulin binding domain (IQ) of CAMTA1. 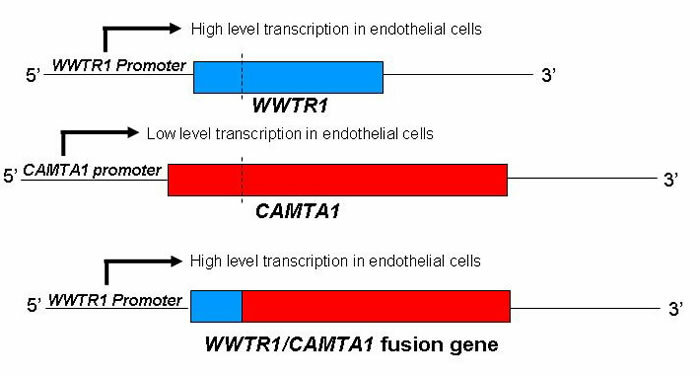 The t(1;3) translocation results in higher than normal levels of CAMTA1 being expressed as part of the WWTR1/CAMTA1 fusion gene due to its location downstream from the WWTR1 promoter that is expressed strongly in endothelial cells. Figure 5A: Simplified schematic diagram of immunohistochemistry performed on EHE cells. An antibody is used which recognizes certain antigens (proteins) on EHE cells (e.g. CD31, CAMTA1) which then results in brown staining. Figure 5B: Immunohistochemistry on EHE cells for CD31, as indicated by the brown staining. Plan Figure 6: Schematic of the ‘Hallmarks of Cancer,’ demonstrating some of the properties normal cells must acquire in order to be transformed into cancer cells (from reference 12). 1A: An antibody is used which recognizes certain antigens (proteins) on EHE cells (e.g. CD31, CAMTA1) which then results in brown staining. 1B: Immunohistochemistry on EHE cells for CD31, as indicated. 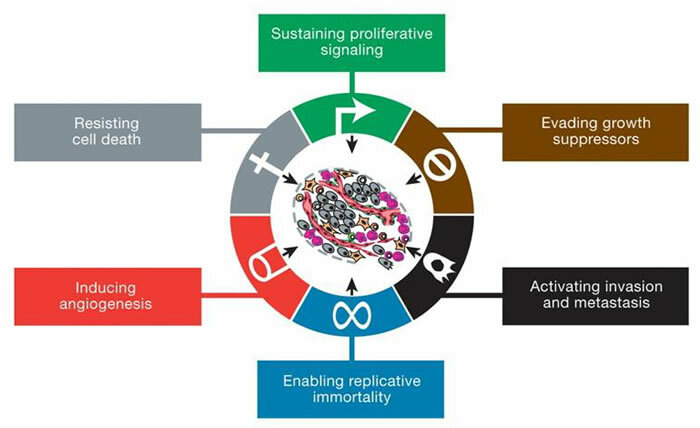 The “Hallmarks of Cancer” highlights some of the properties normal cells must acquire in order to be transformed into cancer cells (from reference ?). 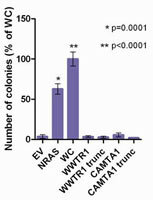 Quantitation of colony numbers for WC in comparison with empty vector (EV), NIH-3T3 cells expressing NRAS G12V, WT WWTR1, WWTR1 exons 1-3 (WWTR1 trunc), WT CAMTA1, and CAMTA1 exons 9-23 (CAMTA1 trunc). Error bars represent 1 SD derived from the values of triplicate samples. Unpaired two-tailed t-test (*, **). Quantitative RT-PCR of different transcripts at 48 hours after transient transfection. Quantitation is fold increase with WC versus vector alone. V8N6 ESUN Copyright © 2011 Liddy Shriver Sarcoma Initiative. The Liddy Shriver Sarcoma Initiative funded this $50,000 grant in December 2011. The study was made possible, in part, by a generous donation of $10,000 from the Center for Research and Analysis of Vascular Tumors (CRAVAT).